Not that any of the constituent parts of the brain trust lighting up Trump for that tweet know it, but air dropping water on the Cathedral would probably destroy the structure. At this point it doesn’t matter. It’s done. Not disagreeing with Trump but how long does it take to get a loaded tanker there? I'd feel confident in betting real money that nobody in Western Europe has the capacity to fight fires like the Western USA does. The French will announce plans to rebuild, a mosque will be built so the French can show the world they aren’t meanies. It's such a wonderful opportunity to build a monument to modern humankind's collectivist transcendence of the primitive idea of an Almighty God the Creator and its infantile implication of objective, absolute truth. Right. So a lot smarter thing to do would be to just let it burn......right? I mean......don't try to fight it from above and below with available technology. Just let that fu**er burn to the ground. How can anyone be so stupid as to think that pouring water or retardants on it from above could possibly help? 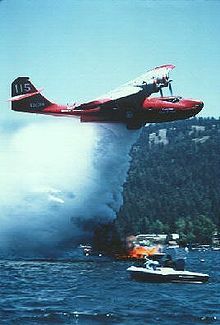 "FireBoss aircraft are capable of working as a land-based aircraft or as a float plane, the Fire Boss can skim water from nearby water sources to continue fighting a fire without having to return to base. The Fire Boss can load up to 3,025 litres of water in 12 to 15 seconds and be back on its way to the fire line in less than 30 seconds." We're gonna need a tanker to put out the TDS fire. They have helicopters that can do the same thing. On the planet that I live on.....helicopters can and do hover and drop the load right on target. But then maybe not the planet on which you apparently reside. Reports that the entire roof has collapsed, and that the entire wooden structure inside is on fire, and likely to be destroyed. "Well, THAT would solve everything, I tell you!" It was W's fault no doubt...the gubmernt is behind this, I tell you!!! They are used for fighting fires in areas that are difficult to access, i.e., wild fires. They can put fire hoses on this urban fire, and are putting fire hoses on it. Trump is a moron.